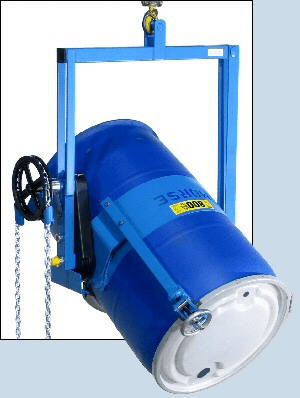 Automatically Adjusts to various diameters of drum! 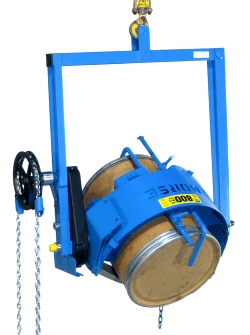 The MORCINCH TM Drum Holder automatically cinches from a 22" to 23.5" (56 to 59.7 cm) diameter drum. . .
MORCINCH TM drum holder. 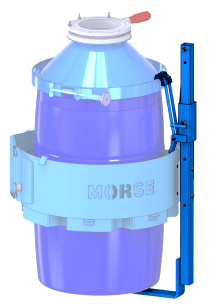 . .
. . .and also with a 23.5" (59.7 cm) diameter fiber drum in the MORCINCH TM drum holder. 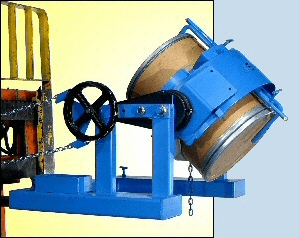 It is designed to automatically adjust for various diameters through the sliding idler shown in the inset. Manually tighten the MORCINCH TM drum holder quickly and easily around your drum. 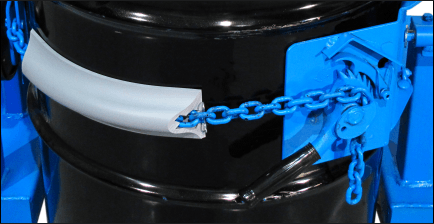 Use the Web Strap and Ratchet to secure your 55-gallon steel drum. 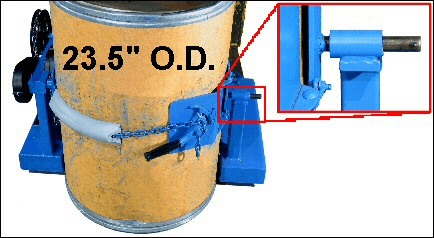 It requires a Top Rim Clamp or Bracket Assembly (shown below) to securely hold a plastic or fiber drum. Option # 5115i-P factory installed on new MORCINCH TM drum holder. Not for use with spark resistant models. 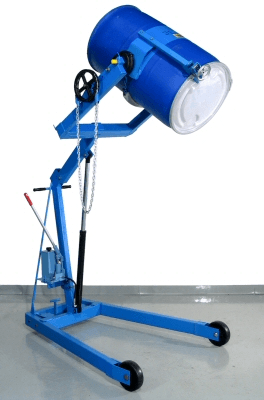 Kit # 5115-P for field installation on existing MORCINCH TM drum holder. Not for use with spark resistant models. Kit # 5115SS-P Web strap and stainless steel ratchet for field installation. 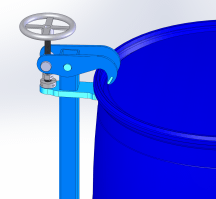 Bolt on the Top Rim Clamp Option to prevent a 55-gallon (210 liter) rimmed drum from slipping through the drum holder. for a rimmed plastic drum. optional Top Rim Clamp installed. 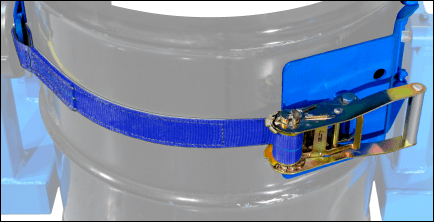 To prevent your rimless plastic drum from slipping through the drum holder, you must bolt on the Bracket Assembly. 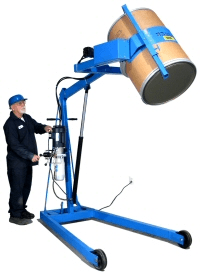 It adjusts for a drum from 31" to 39" tall. 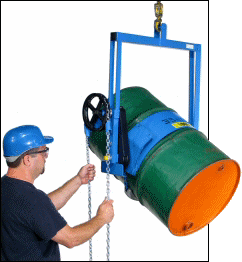 Also recommended when handling a fiber drum. needed for your rimless plastic. It can also be used to secure your fiber drum. To handle your smaller drum, the MORCINCH TM Drum Holder accepts Diameter Adaptors. 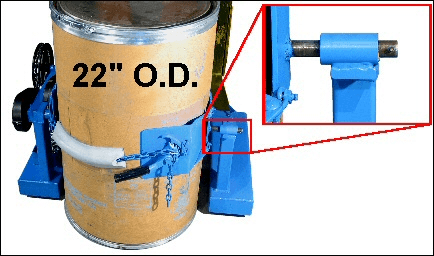 Select the correct size Diameter Adaptor for each drum. Kontrol-Karrier with MORCINCH TM drum holder and optional Diameter Adaptor for smaller drum. 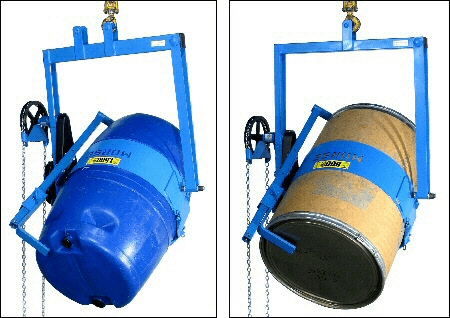 The MORCINCH TM drum handling system.